Welcome to Batchelor Holiday Park. 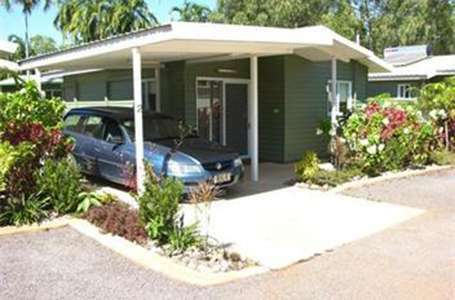 We are located 98 kilometres south of Darwin, at the gateway to Litchfield National Park. 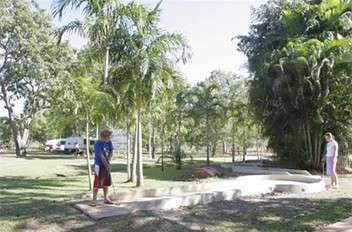 Stay in Batchelor and explore the beautiful waterfalls, walking tracks, rainforest pockets, historic sites, the magnetic termite mounds, natural pools and 4WD tracks around Litchfield National Park and enjoy beautiful Batchelor and the early European history including WWII historical sites. 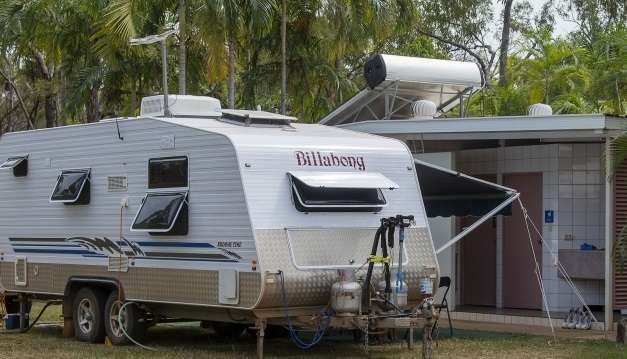 Batchelor Holiday Park provides a range of accommodation including Powered Sites, Bush Camping Powered Sites, Grassed Shady Tent Sites, Ensuite Sites, Large Sites For Big Rigs, Ensuite Family Cabins and Luxury 2-Bedroom Villas suitable for families of 4 people or 6 people. As the sun goes down, raise a glass & enjoy the wild bird feeding in the Park, and then it’s just a short stroll for a delicious dinner in town if you don’t feel like cooking! Batchelor Holiday Park is 'Pet Friendly' but no pets are allowed inside the Villas and/or Cabins. Some guests secure their dog on the verandah or in the carport but never are they allowed inside. Ensuite Villa – 2 Bedroom (4 person).....These 2 Bedroom Villas are beautifully appointed and offer a King Bed in the main bedroom with 2 King Singles in the second bedroom. Villa 3 has a King Bed in each bedroom, suitable for 2 couples. All linen is included. Villa 1 has a large handicapped bath room. All Villas have a fully equipped kitchen with stove, large fridge/freezer, lounge, dining table, 3 split system air-conditioners, large flat screen TV. There is undercover parking alongside each Villa..........Ensuite Villa – 2 Bedroom (6 person).....These 2 Bedroom Villas are beautifully appointed and offer a King Bed and a King single in the main bedroom with 3 King Singles in the second bedroom. All linen is included. The Villas feature a large bathroom. All Villas have a fully equipped kitchen with stove, large fridge/freezer, lounge, dining room, 3 split system air-conditioners, large flat screen TV. There is undercover parking alongside each Villa..........Ensuite Cabin 3.....Ensuite Cabin 3 sleeps 5 people, has an double bed + 1 single bed, + 1 single bunk bed, ensuite shower & toilet. Air-conditioner, TV, Iron/ironing board, a kitchenette with cutlery, crockery, microwave oven, and a small fridge..........Ensuite Cabin 2.....Ensuite Cabin Sleeps 4 people, has a Double bed, + 2 single beds , ensuite bathroom, Air-conditioner, TV, Iron/ironing board a kitchenette with cutlery, crockery, microwave oven, and small fridge. Linen is provided and there is vehicle parking next to the cabin..........Ensuite Cabin 1.....Ensuite Cabin 1 has an ensuite shower & toilet. 1 double bed. Basic cooking includes, microwave, small fridge, electric fry pan, crockery. TV & air conditioning..........Ensuite Powered Sites.....Want some space or an ensuite? Our large ensuite sites are suitable for everyone, from a Hi-ace campervan to a 70+ foot vehicle including slides. Each site has shower, toilet, hand basin, washing machine and private clothes line..........Powered Site.....Powered sites include Power, Water, Sullage, Slab. 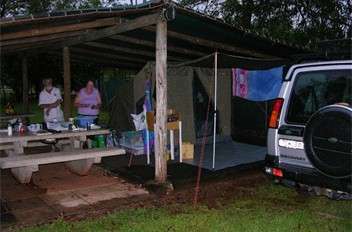 Most have shade & some are drive through suitable for large caravans etc..........Bush Camping Powered Sites.....Bush Camping Sites include Power, Water, Grass. 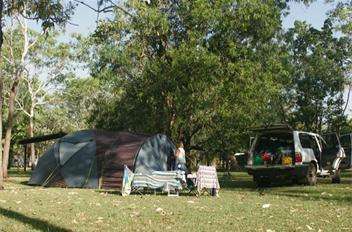 Set in natural bush, most sites have shade suitable for smaller caravans, motorhomes, camper vans, camper trailers & tents..........Non Powered Sites.....Non Powered camping sites with grass & shade set in natural bush. Suitable for smaller caravans, motorhomes, camper vans, camper trailers & tents..........Under Cover Camping.....Covered area suitable for tents with concrete table & bench seats..........Facilities & Activities.....Batchelor Holiday Park has all the conveniences of being located in a small country town, with full Telstra mobile coverage, power & sewerage. It receives all of Darwin’s free to air TV channels..........Facilities.....Full Telstra Mobile Coverage...Digital Television & Net4 Wifi...Close to Batchelor Township, Shops & Tavern...Shady Pool...BBQ...Natural Bush Setting...Pet Friendly...Mini Golf...Laundry Washing Machines & Dryers...Clothes Line...Amenities Block...Tourist Information and/or Bookings...Groups Welcome...Internet – Wireless...If you like to not only surf the waves but the information highway, then we have got you covered. We offer wireless internet around the park’s grounds..........Park Activities.....Batchelor Holiday Park offers an variety of activities for guests that include an 18-hole mini golf course, wireless internet, and a shady pool. 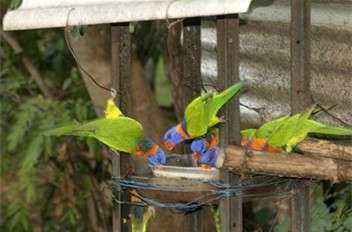 We feed the wild native birds twice daily.....The birds have been visiting at 7.30am and 5.45pm every day for over 25 years. Many birds usually arrive including Red Collared Lorikeets, Yellow throated Miners, Bower Birds, Silver Backed Butcher Birds, Magpie-Lark , Blue faced Honey Eaters, western variety of Galah, Little Corellas, Bar Shouldered and Peaceful Doves......Other birds seen around the park include Ibis, Kookaburras, Torres Pigeon..........Activities......Bird Watchers Paradise...Native Bird Feeding Daily...Close To Tourist Attractions...Close to Waterfalls...Shady Pool...BBQ...Natural Bush Setting For Walks...Mini Golf..........Batchelor & Litchfield Area Things To Do.....Litchfield National Park...Enjoy swimming and bushwalking in this pristine national park. 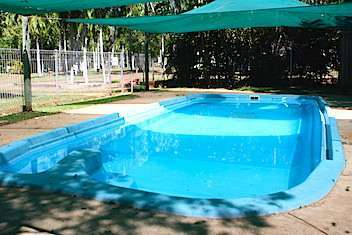 Batchelor Holiday Park is located just 14kms from the boundary. See a great display of magnetic termite mounds and huge cathedral termite mounds. All your local information is provided at check in..........Swimming...Florence Falls, Buley Rockhole, Wangi Falls, Walker Creek, Cascades, Tjaynera Falls and Surprise Creek Falls are designated swimming areas. Note: some of these areas can become unsafe after heavy rain and may be closed for swimming..........Walking Tracks.....Beautiful walks leave from most popular sites. Signs in the carparks and along the tracks will show you the way. They vary between short strolls and walks of 1 to 3 km. The longer 39 km Tabletop Track circuit is an excellent long distance bushwalk. It is generally open during the dry season and by permit (phone (08) 8999 4486) at other times due to hot and humid conditions.Batchelor.....A beautiful lush town with immense historical interest. Collect a map of the Batchelor Heritage Walk and enjoy the history of Batchelor at your leisure. Over the war years Batchelor hosted some 36 individual RAAF, USAAF and Dutch units before reverting to its civilian role post war......A visit to the interpretive Batchelor Museum is within easy walking distance; the museum details the history of Batchelor back to 1911.....Litchfield Scenic Flights & Charter offer scenic flights over Batchelor, Litchfield National Park and surrounding areas. The aerodrome serves as a general aviation and maintenance facility and also as the hub for gliding activities in the Top End.